Within the City of Chilliwack, there are floodplain areas for both the Fraser River and Vedder River. Portions of Greendale and Yarrow lie within the floodplain for both rivers. Flood Hazard - What Does it Mean? Flood hazard is often expressed in terms of the likelihood or probability of a given flood event occurring. For example, the 1894 flood on the Fraser River is the largest flood on record, and is estimated to be a "1 in 500 year" event. The provincial dyke standard and floodplain mapping for the Fraser River is based on this event. The expression "1 in 500" does not mean that this size of flood will only happen once every 500 years. For example, we can't say that because it happened in 1894, it won't happen again until close to the year 2400. Rather, it means that there is a 1 in 500 chance of it occurring in any given year (1/500 = 0.2% chance per year). Similarly, the provincial dyke standard and floodplain mapping for the Vedder River is based on the "1 in 200 year" event. This means that there is a 1/200 (0.5%) chance of it occurring in any given year. This explains why we can hear about large flood events, for example "1 in 100 year" flood events, happening two years in a row; the "1 in 100 year" events have a 1/100 (1%) chance of happening in any given year. The Provincial River Forecast Centre collects and interprets snow, meteorological and streamflow data to provide warnings and forecasts of stream and lake runoff conditions around the province. Visithttp://www.env.gov.bc.ca/rfc/ for current reports. 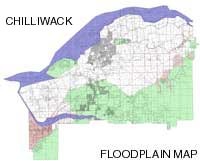 The City of Chilliwack uses the information provided by the River Forecast Centre when carrying out flood response activities. Download and print an Emergency Preparedness basic kit checklist (Grab & Go Kit). There are a number of resources that you can access to be prepared in the event of a flood. The following websites provide information on flood and emergency preparedness for the agricultural sector: BC Milk Producers Association (www.bcmilkproducers.ca or 1-877-462-2672); Ministry of Agriculture and Lands (http://www.gov.bc.ca/al or 1-888-221-7141); BC Horse Council (http://www.hcbc.ca/ or 1-800-345-8055). Due to variables such as weather, we cannot predict a flood with 100% certainty. Therefore, it is important that you make your plans on the assumption that flooding is a real possibility. The best thing for people to do is to review or establish personal and neighbourhood emergency plans and consider family members or friends who may need additional assistance. Please help those folks to be ready as well. It is important to note that even if your home or business is located on higher ground, a serious flood event would result in a loss of key services like water, sewer, electricity and gas. In that case, a City-wide evacuation could occur. All residents should be prepared for at least a 72-hour period without services. We will provide as much information as possible to keep the public informed as waters start to rise. Check this map to find out. What elevation is your home at? Check this map to find out. The floodplain is accurately shown on this map as based on the 2007 update. When the next mapping update is completed, it is not expected to significantly change the extent of the floodplain. Find information on the Fraser River Freshet and general flood protection information. River levels are expected to continue to rise this week. The River Forecast Centre has issued a High Streamflow Advisory for the Lower Fraser River. Preparing For An Evacuation: In flooding situations, residents in high risk areas should listen to the local media and follow the instructions of local emergency and transportation officials. Thank-you to those who attended the community meetings to discuss flood protection improvements. In order to meet current provincial flood protection standards, this section of Young Road will be upgraded.